As technology changes rapidly, there's an ever-increasing need to remove old infrastructure especially as data-centre space is often at a premium. Equipment decommissioning requires the same level of meticulous planning as a new installation, so as not to interrupt live service on neighbouring equipment and cabling. Plus with the latest WEEE directive, any disposal of equipment must be carried out through qualified and authorised channels. We have the expertise and experience to deliver your organisation a professional and perfectly executed decommission program, regardless of the technology being removed. Our project management team will leave ‘no stone unturned’ whilst working with you on the planning stages of your project. We will cater for all aspects of your decommission regardless of the complexities. Whether you are removing cabling, equipment or you require data cleanse to be performed, IISAS can cater for your requirements no matter what the scale of the project. We partner with only the best organisations to ensure premium quality power isolation and removal, physical equipment extraction using heavy plant machinery where necessary and professional logistics to ensure you get the best service available. All of this is managed and co-ordinated by our expert team ensuring that all Health and Safety standards are exceeded. 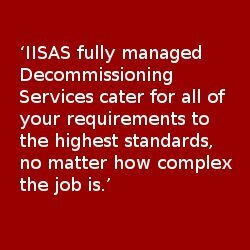 If you need help with decommissioning your equipment, you can rely on IISAS for a thorough plan and perfect execution. Adherence to your standards / full works inspection by you. As our existing customers have already experienced, we'll surpass your expectations every step of the way and your site will be as good as new when we're finished.